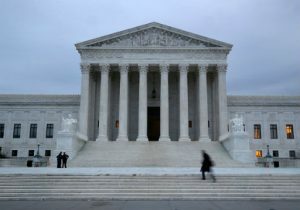 A unanimous decision issued Monday by the Supreme Court carried with it several concurring opinions from the Court's liberal justices, suggesting an ongoing interest from that wing in revisiting the constitutionality of the death penalty. The case, Dunn v. Madison, concerns the intellectual competence of Vernon Madison, convicted in 1998 of the murder of police officer Julius Schulte. Madison had suffered several strokes in the time between his conviction and scheduled execution, and could not recall the details of his crimes, though did admit to understanding why he was being executed. Madison petitioned for a stay of execution on the grounds that, due to his strokes, he lacked "the mental capacity to rationally understand that he is being executed as a punishment for a crime," a standard set up when the Court struck down the death penalty for the mentally ill in Ford v. Wainwright. The eleventh circuit court of appeals agreed with Madison. In a per curiam (issued as a unanimous whole) decision, the Supreme Court reversed the eleventh circuit, narrowly ruling that under existing statutory rules—specifically, the Antiterrorism and Effective Death Penalty Act (AEDPA) of 1996, which set many constraints on death penalty litigation—the case as presented did not merit full consideration. Two concurring opinions from the Court's liberal justices signaled skepticism about the underlying issues of the death penalty for Madison and the death penalty in itself. Justice Ruth Bader Ginsburg, joined by Justices Stephen Breyer and Sonia Sotomayor, noted in a one-paragraph concurrence that while the AEDPA's constraints, "preclude consideration of the question," Madison's appeal pointed at a deeper concern. "The issue whether a State may administer the death penalty to a person whose disability leaves him without memory of his commission of a capital offense is a substantial question not yet addressed by the Court. Appropriately presented, the issue would warrant full airing," she wrote. Breyer, in a separate, solo concurrence, reinforced his past concerns about "one of the basic problems with the administration of the death penalty itself … the unconscionably long periods of time that prisoners often spend on death row awaiting execution." He pointed to the extended periods of time—decades—that capital convicts spend on death row, suggesting that it would become an increasing problem as death penalty cases continue to drag. "Rather than develop a constitutional jurisprudence that focuses upon the special circumstances of the aged, however, I believe it would be wiser to reconsider the root cause of the problem—the constitutionality of the death penalty itself," Breyer concluded. This opinion dovetailed with—and relied upon references to—Breyer’s dissent in 2015's Glossip v. Gross. That case concerned the constitutionality of a certain kind of lethal injection. However, in a lengthy dissenting opinion joined by Ginsburg, Breyer called for "full briefing on a more basic question: whether the death penalty violates the Constitution." Dunn further contributes to the sense that some on the Court, including at least Breyer and Ginsburg, may be interested in revisiting the death penalty's constitutionality. The Court's four conservative justices—Chief Justice John Roberts and Justices Clarence Thomas, Samuel Alito, and Neil Gorsuch—are generally agreed to be fairly safe pro-death penalty votes. Breyer and Ginsburg, meanwhile, are among the group of justices who seem suspicious of the death penalty in and of itself. "From my reading of what gets said, and more importantly what does not get said, and who's not saying it, the movement to abolish the death penalty in all circumstances probably has at most three votes on the Supreme Court," said Bill Otis, a former federal prosecutor, professor at Georgetown law school, and outspoken proponent of the death penalty. Otis suggested that Sotomayor's concurrence in Dunn, as well as her separate dissent in Glossip and several comments at law schools, all suggested that she had moved towards Ginsburg and Breyer's skepticism of the death penalty. "It seems to me that Justice Sotomayor, although she has never said so directly, is very much leaning in the direction of at some point taking the view that the death penalty is constitutionally impermissible in all circumstances," Otis said. That leaves two justices: the liberal-leaning Justice Elena Kagan and Justice Anthony Kennedy, who is generally perceived as the Court's swing vote. Kagan, an Obama appointee, was conspicuously absent from either concurrence in Dunn. While she did join Sotomayor's narrow dissent in Glossip, she also did not join Breyer's more wide-reaching dissent. During her confirmation hearing, Kagan called the death penalty's constitutionality "established law," further insisting that it was "settled precedent going forward" that should generally not be disrupted. However, that does not guarantee that she has not "evolved" on the issue, as some of her peers have historically. Kennedy's vote on abolition also remains up in the air. Otis pointed to his past rulings in cases like Roeper v. Simmons, which struck down the death penalty for minors, but also noted that Kennedy joined the Court's majority in Glossip, suggesting he may have grown more execution sympathetic. Evan Mandery, chairperson of the department of criminal justice at John Jay College and a death penalty expert, cautioned against reading too much into Dunn, noting that Breyer's dissent simply reiterated many of his concerns in Glossip and that the case mostly concerned a narrow issue pertaining to AEDPA. "I don’t really think it's like a game changer in any way in terms of reading the tea leaves," he said. "I think what they're saying is, they think it's a legal issue that merits full consideration. I'm sure it wouldn't be first on everybody's plate of things to take on about the death penalty," he said. Questions of whether or not the death penalty violates the Eighth Amendment, which prohibits "cruel and unusual punishment," have been before SCOTUS before. In 1972, the Court issued a nationwide moratorium on capital punishment in Furman v. Georgia, a moratorium that was ended four years later in Gregg v. Georgia after reforms from state legislatures. Since then, many have tried to challenge the death penalty's constitutionality. Most recently, former acting Solicitor General and celebrity litigator Neal Katyal filed a petition in Hidalgo v. Arizona to challenge Arizona's death penalty, as well as asking the Court to consider, "whether the death penalty in and of itself violates the Eighth Amendment, in light of contemporary standards of decency." The Court has not yet agreed to hear Hidalgo. If it does, it may pose a serious challenge to capital regimes across the country.